Welcome to the Donghwa Cultural Foundation. Become a member of Donghwa today! Our members are our vital supporters as we seek to raise the awareness of East Asian art and traditions in today’s multicultural society. Sign up now to donate and receive a newsletter to keep up to date on our upcoming programs and events. How have your cultural views changed in today's globalized society? The 2016 East Meets West International Essay Competition seeks to provide an intellectual and creative forum that empowers young voices and broadens the dialogue on cultural awareness and exchange. The competition is open to all high school and college students. The Grand Prize is a $1000 cash award. Subsequent Gold, Silver, and Bronze Awards in $300, $200, $100 amounts will be awarded to students in High School and College Divisions. Additional non-cash awards are also given by our partners and sponsors. 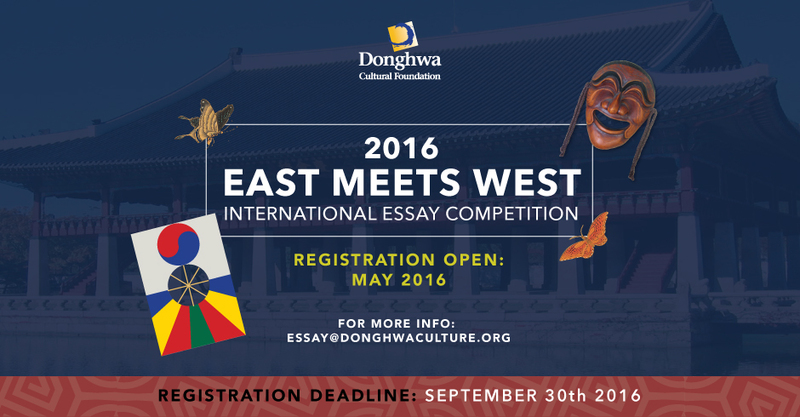 The East Meets West International Essay Competition is organized every year by the Donghwa Cultural Foundation. We are a non-profit 501(c)(3) organization that promotes East Asian culture, philosophy, and art through our programs and events. We invite you to participate in this essay competition and help create a space for the cultural harmony we hope to spread. For more information on the competition, and to read the winning entries from our previous competitions, visit our blog at eastmeetswestdonghwa.wordpress.com. We will be accepting entries from June 1 through September 30, 2016. Essays can be submitted through our email address at essay@donghwaculture.org or submitted via post to the following address: PO BOX 271, Englewood, NJ 07631. Guidelines and Essay Topics, as well as the competition poster, is attached above. Please use the following online application form to apply. All applicants must submit an online application or their essay will not be accepted. If you have any further inquiries, please contact us via essay@donghwaculture.org or 201-871-3033. © 2013 Donghwa Cultural Foundation. All Rights Reserved.